This weekend will find me in gorge-ous Hood River, Oregon. We head there annually for My Fine Husband to attend an industry event. 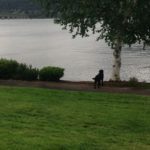 We stay on the shores of the Columbia River, in a canine friendly hotel and soak it all in. He gets education and connects with others in his industry (he’s a pro brewer) and I get to see people I know and wander the shoreline with the Kids or work or whatever I feel moves me. This year is particularly poignant because last year, on this exact trip, our 15+ year old beloved dog died. It was dramatic and fitting all at the same time. Her breed, Labrador Retriever, can’t get enough of water. We had arrived and were stretching legs having made the 6-hour car trip. She slipped over the bank quicker than we realized and paddled weakly in the Columbia. My husband shouted to me in that EMERGENCY tone – I ran to him, saw her in the water and immediately jumped in. I fished her out of the river, having gotten to her after her head began nodding under the surface, no longer paddling….I can understand how humans lift cars off their loved ones in a panic. Her 65 pounds of limp wet weight was nothing to me in that moment. Your heart stops at the same time instinct kicks in. I didn’t hesitate for a moment in jumping in this massive river to save her. Thankfully I could touch bottom and we brought her up the bank, settled her head downhill to try to get rid of some of the water she had taken in. I quickly and strangely enough realized that it was her time to go. Hops, wondering where Belle has gone. Even typing this now my emotions well up and I miss her something fierce, caught in the memory of what happened. And how unexpected yet perfectly fitting of an end she had to a wonderfully full and giving life. The vet who answered the late night call was compassionate and professional, which obviously helped ease the pain everyone – Belle included – was feeling. Why the hell am I sharing this with you? Because Belle is on my mind and heart. Because there is meaningful poignancy in everyday living. Sometimes we see it, live it viscerally, sometimes we don’t realize what’s happening until we’re in the middle of it and sometimes we don’t see it at all. How does this relate to Beer? In my world, everything is related to everything else. Belle, my beloved canine, saw me through the entire launch of my businesses – all of them, beginning in 2002. I knew her longer than I knew My Fine Husband. And she knew me better than anyone else. My Fine Husband fell in love with and got to know dogs because of her. He feels the pain acutely as well, his first death of our beloved immediate family member. Life without dogs ain’t worth it to me. Life without beer goes on. 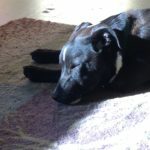 Züc, our newest family member, soaking up the sunspot. When life goes wonky, we need to keep it all in perspective. A family member dying is difficult at best; when it’s a member we truly and deeply love it’s brutal. The celebration of her life this weekend will help us keep moving through it, though the feelings never completely dissipate. Memories of our beloveds, like my friend Walt says, they live in our hearts forever – and isn’t that a great place to be. Yes. If we can’t be together in life, then we’ll always be connected in our hearts. But damn, I miss her. Take it all in stride, don’t stress out about things that ultimately don’t matter – like being a beer snob or not being able to get the beer you want at any one time. Life moves. It’s up to us to act with grace and take it all with gratitude, not for granted. There is poignancy in the everyday. Enjoy it all. 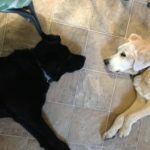 We’ll celebrate her with a memorial picnic, with Hops – the other four legged family member who lived it with us – and our newest family member, Züc. Our humblest effort to cheers a fortunate life well-lived and appreciated. 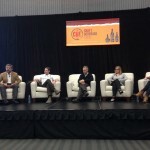 Last fall I had the pleasure to speaking on a panel at the Culinary Institute of America’s first Beer & Food Summit. What a ball! The people present were all very engaged. It was a very mixed group from all sorts of backgrounds and professions. of beer. I’ve heard him speak a few times and he’s lively, funny, and gets to the point. To hear him promote the idea of celebrating diversity in what beer is today is encouraging. The word Diversity seems to be everywhere today. No surprise there since our world is expanding, exploding and integrating faster than ever before (again, no surprise). Celebrating diversity in our mindbogglinglyfast changing world is a great approach. Like a good friend of mine tells me, change is coming whether you want it to or not. May as well open your arms and welcome it. Where are they: stories about women and beer? I know from doing previous herstorical research that women have always been involved in beer and brewing. It started as a home chore, making liquid safe to drink when water was consistently onerous. Once the church decided to remove it from home-made to commercially made during the industrial and scientific revolutions, women were shoved aside, no longer the venerated makers of the elixir they once were. Everyone needs to know about women and beer. Phil & Larry will be the first in line. So where did the record keeping ball get dropped? It’s a grossly unfortunate fact that much of women’s’ contributions throughout time have not been recorded; women not being seen with fully and equal value, hence the negligence of recording women’s beer herstory. There’ll be no pity parties or Poor Me crap. No one wants to hear it, least of all me, and it won’t move the progress cart forward. So, here are your marching orders: help me record women & beer through herstory. So it’s time to reinvigorate and renew our efforts to record how women have always been involved; bring the import of women & beer to the front row. Sing the praises of women far and wide for their participation in this originally home-cooking based beverage. Tell me: who do you know involved in beer in any & every way? Pro, in any possible capacity supporting the business and global industry of beer. Enthusiast, all makes and models, ages and descriptions. Educators, any level, every where, teaching some facet of life that touches beer. Writers, reporters, journalists – every woman and female who exercises communication of beer. Every other facet that we can possibly dream of. I’d be grateful for your help, directions, and ideas to this end of creating a modern recollection of how women and beer go so well together. Thanks in advance for your help. My Fine Husband and I met February 6th, 2002. I was on a date (with someone else) and he was the Brewmaster leading a beer dinner with the AKM, at Granite City Food & Brewery, Sioux Falls SD. To celebrate this meeting and then our first date March 1st 2002, we recently decided to recreate the specialness of that meeting by making our own in-home beer dinner. Date night. What a great idea!! And why hadn’t we thought about it before….oh well…no matter. 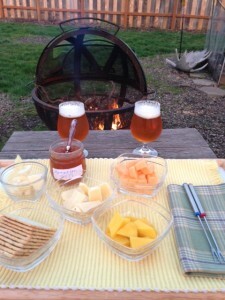 First course….complete with a cozy fire. Once we decided to have this fun dinner celebrating us, we endeavored to put together a menu. Larry chose and procured the beer he desired for the evening, then I put together a complementary food menu. What fun it was to do so – knowing so much more about beer, pairing and cooking with beer now than I did 14 year ago…. When I went on that fateful February date, I went because it was Something To Do – not because it was a beer dinner proper. It was a fun thing two people who hardly knew each other could do together and converse throughout. In retrospect, it was the fact that the date in particular was quickly becoming a first and last with that person (nice guy, just not for me) that motivated me to turn my full attention to the event: learning about beer and food together. Now, I grew up with a dinner party throwing family so the idea of coming together over beverage and food was familiar and attractive to me. To feature beer was the new idea – since my family mostly had cocktails and a bit of wine. Beer was around, simply not at these parties for whatever reason. I shared a bit more of the story in my TED talk here. Fast forward to a month ago. The beer dinner we decided to throw ourselves was a really fun way to celebrate meeting and beginning our relationship. Here’s the menu we enjoyed. Sierra Nevada Brewing Company’s Harvest Wild Hop IPA paired with sharp cheddar cheese, apricot preserves, water crackers, and fresh cantaloupe. Pfriem Family Brewers Pilsner with fresh greens salad tossed with honey mustard vinaigrette, ricotta and cucumbers. Firestone Walker Velvet Merlin with slow cooked beans and pork topped with shredded mozzarella served with crunchy toasted bread and savory cumin tomato spread. Boulevard Brewing Tank 7 with baked custard, topped with apricots, mango, mint, banana and coconut shavings. 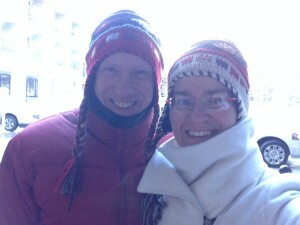 My Fine Husband & me celebrating – cheers! If this all sounds good to you, go ahead and reproduce it as you wish, of course! Celebrate your own wonderful occasions with this or a menu of your own devising. Life is worth celebrating. Do it often. Cheers to My Fine Husband, professional brewer and love of my life. Here’s to years of fun dinners together forever. For those of you who happen to have a Women Enjoying Beer pencil, please bow your heads for a moment. Goodbye to the Sanford Giant, she served me well. Welcome Staples model. We’ve got lots to do ahead…. It’s with sadness I announce: I’ve killed a pencil sharpener. Rather, I’ve likely exhausted it thoroughly so it now gets to go to the Great Recycling Beyond. It’s with joy in my heart though and a tear in my eye that I put it to rest in the metals bin. This stalwart champ has seen me through thousands upon thousands of pencil sharpenings since I began buying pencils as promotional items. She’s stood by my side through my Snap! Creative Works company pencils, then into Women Enjoying Beer. 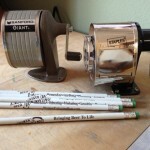 The pencils sharpened by this gem have been used at festivals across the North American continent, given to class attendees, at events, and to clients. There’s a gut level connection to pencils for many people. They have generally played a role in helping us learn how to write, spell, and create term papers on topics without which we’d be stuck with an unerasable pen (goodness!). They seem to evoke nostalgia and people smile when they receive them. That in turn makes me happy. And it tells me it’s an effective marketing tool. So if you have one of the said pencils – whether from Snap! or Women Enjoying Beer and are willing to take and post a picture here, I’d love to see some of them. If you’d like a few more, get in touch – I can get you some fresh reinforcements. Thanks in advance. Yes, it’s that time of year again folks: The Big Beers Belgians and Barleywines Festival is kicking off this week in snowy gorgeous Vail, Colorado, USA. Yours truly will be returning (queue the music please) to give a lively & info chocked beer & cooking session: How To Cook With Beer, Wandering Around The Kitchen with Ginger. It’ll be loads of fun, there will be tastes and tricks, tips & ideas for you to take home with you. 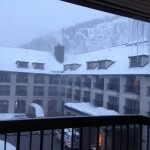 Vail Cascade Resort awaits BBBB…. Laura & Bill Lodge, Sister & Brother Wonder Team, put together this world class event and I’m thrilled to be heading there again. In 2014 I was invited to present for the first time – here’s the menu I made & served to the happily SRO room. Wow! Yes, please – sign me up for more. They do such a great job there’s a wait to be asked to return to present if you fit their needs. 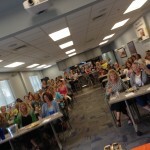 I’m also hosting a Marketing Beer To Women Workshop, Pour it on! You can register here. Laura knows I’m available at a moments notice for this one and anything she’s involved in. Great people usually = great events. Hats off, pints up and skis on – see you in Vail! Good Grief, Charlie Brown!! It’s the giving season again…. And where ever and however quickly it came from (seriously, only 300+ days ago?? ), tis the season. While I give the gift of books in particular year round, I want to share a few favorites with you today for beer & flavor lovers everywhere. 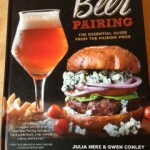 Beer Pairing, The Essential Guide From The Pairing Pros, Julia Herz & Gwen Conley *just* released (2015 Voyageur Press). I’ll have Julia sign my book when next I see this dynamo of the beer gospel. Both she and Gwen have cut a smart swath to helping people enjoy beer. It’s a comprehensive book on what, why, when, how and why not of beer and food pairing. A great read and flavorfully inspiring, once you buy one for yourself get a few for others. Cheese & Beer, Janet Fletcher (2013 Andrews McMeel Publishing). Janet’s written a few dozen books on food – cheese being her forte and oh-so-deliciously so! Others include Cheese & Wine, The Cheese Course, Yogurt (a personal fav go-to), and Four Seasons Pasta. All dandy and mouthwateringly fun and functional. Her writing style and the information she gives us is timeless and well rounded by smarts and broad world view. Ambitious Brew: The Story of American Beer, Maureen Ogle. Maureen is an historian and was inspired to write about beer upon wondering what her next book was – and at that moment having a Budweiser truck cross her path while driving. Inspiration struck and she’s tells the story starting in the 1880’s to modern times. Great read like many with herstorian context: you learn way more about way more than you think. The American Craft Beer Cookbook, John Holl (Storey Publishing 2013). John’s an accomplished journalist and definite flavor lover. I’ve had the pleasure of sharing many beers with him as well as having hosted a book signing party when the book came out. He’s collected recipes with beer in them and paired with beers from brewpubs across this fine country. With sidebar stories and additional beer suggestions included, this book is a winner winner beer for dinner. Beyond books, I’d invite you to find a few Women Enjoying Beer & Men Enjoying Women Enjoying Beer goods on our shopping page. Since we’ve exited a very successful festival circuit run, we’ve got a few goodies remaining looking for great homes. Be ahead of the curve as they may be collectors items soon! Our local breweries need our business. They pump ridiculous amounts of effort & money into our local economies, all the way up to the federal level (ask them about excise taxes, for example). Visit them all, as you can and see fit. Ask them questions, listen, share, buy and support. 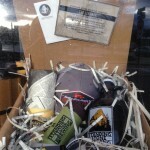 One of my locals, Standing Stone Brewing Company, sells Brewer For The Day packages as well as the holiday Gift Six Pack. Order a keg in advance to help celebrate in tasty fashion, give the gift of lovely glassware. Home brewing abounds in America! It’s a fabulous opportunity to learn to cook a whole new recipe: Beer. Locate your local shops and go to a demo, hang out with the local clubs, and start making your own. 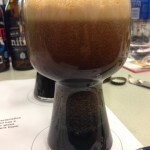 Like food cooks, many professional “beer cooks” start by homebrewing. The American Homebrewers Association is a super place to start. Whatever you do, give the gift of flavor this season – and year round. Start with flavor first, experiment, try, share and repeat. Beer changes as does everything else in life so pour it on. My reply included the fact that I’ve had Women Enjoying Beer for 7 years now and it remains part of my businesses and pursuits. The word ‘Niche’ has always gotten a bit under my skin, though I know what the reader is asking and rightly so. Niche seems to minimize, to somehow make it feel frivolous and inconsequential. Quite the contrary. Women & Beer = universal. Women + Beer = change the world. Women + Beer = fascinating conversation. 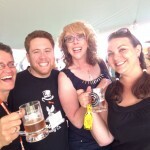 Women + Beer = progress for gender equity when done right. You must have a focus for any entity, any tax status, any reason before you open doors to be In Business. My focus has been on women and their relationship with beer. As the industry pioneer in this endeavor, to talk with, listen to and gather the insight from women directly, I’ve found the entirety of input mind blowingly thought-provoking. Limiting? No way. Hell, it’s been an explosion!! A population previously unasked (women) about a global fact of life in earth as a race (beer) has continued to gather attention, spur students, media & press to contact me & want to talk for a paper they’re writing, and still invites smiles from the unfamiliar when they see my logo. I’d limit myself and opportunity for women everywhere if I didn’t ask the questions I do of women as it relates to beer. Why do I do it? Because I want to know, who more women don’t enjoy beer. Because I know now it’s not about women or beer, it’s a much bigger scope and purpose. Because no one else has deigned to see the import of talking with the worlds largest global population about an everyday topic. When this happens – when there conversations happen – we open doors into all sorts of other concerns, issues and topics. It’s like tipping dominoes that can never return to a stultified position (thankfully). Distilleries are certainly open to contacting me as well – as are wineries, cideries, book manufactures & authors, car makers, plumbers, insurance agencies, and every single other good & service. Marketing services based on our singular and proprietary qualitative psychographic research benefits everyone, beer enjoyer or not. I can help all businesses who are serious about properly and successfully marketing to women. It’s the big pictures made up of small pixels that change the world for the better. 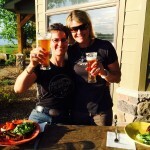 Women + beer = big picture = conversations that improve our planet. Do you ever participate in parades? If you do, you’ll want to get in touch for the outline of Parade Marketing Insights from me. Yesterday I delivered a workshop at the invite of my local Chamber expressly addressing smart, effective & green parade ideas. In years past, the conventional and stupid (yes, I’ll say that) practice of handing out flyers and candy has been the standard. Why? ‘Cause “people like it.” Not so if you’re looking to be smart business wise and conscientious to Mother Earth. The practice needs to be nipped all the way to the roots. The participants who invested their time walked away with immediately useful tactics to employ – well beyond the parade focus. In fact, one of my local colleagues didn’t realize it was bent towards parade participation. They simply saw it as an opportunity to learn more about marketing. Brilliant!! Marketing is communication. Communication creates memories and experiences which drive success and sales. Anytime you can find education that helps you grow from a credible source for pay and for free or sponsored, GO. We all must keep learning to stay viable in our societies. The best and most credible teachers are always going to school in some way. Thanks & cheers to a great 4th! Fresh from the 2015 Craft Brewers Conference and soon headed for the Craft Beverage Expo, here are 5 reasons why beer – and perhaps your brand of beer – is good for communities. 1. A beer production facility is good for local economics. The equipment, infrastructure, and relationships a brewery creates is real money for towns and cities. Find ways to support your local breweries like contacting your mayor and council to tell them as much. 2. Beer has always been a family oriented beverage. If we look to America in the 1800’s, we see a huge immigration of hard-working people who moved to the country to realize their own dreams; many of them were to open and operate responsible breweries. Those bucolic images of families on the lawns? Many came from the biergartens of Europe. 3. Beer makers pay serious taxes. Said another way, those who make beer are willing to pay taxes to do and make what they love. They pay an additional tax – excise tax – that few manufacturers have to. 4. Beer brings people together. 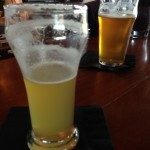 As a highly socially oriented beverage, beer is best enjoyed in the company of others. People in groups are pretty good at self moderating, watching out for each other and tempering potential ill effects of alcohol. 5. Beer complements food – and therefore the restaurant business. With 4 primary ingredients to start, beer is a flavor pairing opportunity waiting to happen. It’s fun to mix and pair, match and try. For those who are scared of alcohol in general or turned off my beer in specific, reconsider why you feel that way. If you’re and adult and can make up your own mind, choose to support beer. You don’t have to drink it to enjoy the positive benefits. In moderation, with the true goal of enjoyment and not drunkenness, beer brings a great deal to our communities in America and the world over. Mmmmmm…Chocolate and Beer – what a lovely coupling! So went two successful highly tasty and entertaining classes to that end last weekend at the 11th Annual Oregon Chocolate Festival. Karolina Lavagnino, Sales & Marketing Director of the Neuman Hotel Group, started the fest 11 years ago to create excitement and business in the shoulder season between winter and spring. I started giving the tasting classes 4 years ago with immediate success. The rooms fill quickly with enthusiastic people, open to trying new combinations and thinking in new ways about what we eat and drink. 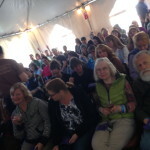 This year we were moved into an outdoor tent to seat up to 65+, up from the 40 seats in previous years. And WOW!! The rush to get in felt like a concert was going down. Both days our fantastic security pro Stephanie helped us with the flow, and Ben, Dana and Christa (crew from the Springs) were spot on with their assistance. Ginger & Stephanie ready for the crowds! Pairing beer and chocolate is so easy, fun, and simple that it’s amazing more people are new to it. Experiment at home: get chocolates and beer – a variety of both – and invite some friends over to sip, nibble, and explore. The best palate starts with an open mind. See you at the fest next year!! Thanks to all the energetic and very fun guests. Come see us next year – and know we’re available to hire for your private and business events as well. Thanks to the Hotel Crew. Everyone from security and service, organizers to staff is super helpful, upbeat, and competent. Thanks to Sean Marc Nipper, Reel House Films Filmmaker, and Erika Bishop, Producer, for their efforts Sunday in capturing the fun on film. Thanks to My Fine Husband for his assistance and unflagging support. We invite one and all to join us for a celebration on November 20th for Women Enjoying Beer’s 6th Beerthday. It’s FREE and all guests need to register on line – here’s the link. All ages welcome at our fine host (until 10 pm) 4 Daughters Irish Pub. They’ve been terrific clients and partners for years. From 6 – 8 pm, we’ll be talking, laughing and entertaining the group – drink & food are on your own, though I have been known to buy a round for the room! Come see what happens. I’ll give a fun & lively presentation at 630 pm as well. Plus: The fun continues the next morning as WEB hosts Ashland Chamber of Commerce Greeters meeting – all welcome once again – from 830 – 930 am, at Louie’s Pub, downtown Ashland, OR. We’ll have a ribbon cutting to celebrate at that time too. If You Didn’t Do What You Do, What Would You Do? Kind of like the woodchuck…what would you do given no other influencers than desire? It’s unusual to get a new question at a professional workshop wherein I’m the invited or paid presenter and educator. So last summer when a gentleman in the room asked me “What do you hate about your job?”, I was stumped. His question caught me off guard for a few reasons. I focus on the positive and look forward, instead of for and at the negative. I’d honestly never considered that question in my mind, partially because I like what I’m pursuing and making happen. Hate is a really strong word – one I rarely use. After stammering for a moment, and pausing for another moment or two, I’m sure I came up with some sort of response (I’d have to ask him to see if he remembers). What I do remember is that it made me reconsider what I DO like about my company and how I spend my days. Life is either too short or too long, depending on your vantage point. Either way, choosing to invest the limited hours of life we get is a conscious choice and we should use it wisely. An old adage is still timely and true: Life’s short, play hard. I’d adapt it to this; Life’s short. Do what fulfills you and makes you happy. What I Hate About (Any) Job: Arrogant people, selectively ignorant people, snobbery, and other garbage usually perpetuated by people. So I avoid those people. What I Love About (Any) Job: Mind expanding positive people, interesting new experiences, flavors, travels, changing culture for the better, improving gender equity, having fun. Wow – it’s already around the corner: Great American Beer Festival 2014. If you’ve never been and are headed there for the first time, welcome to the crazy, tasty fray! Bring a water bottle to refill and hydrate between delicious beer, eat a solid meal shortly BEFORE you arrive, and practice moderation. It’s for everyone’s enjoyment and drunkenness isn’t appropriate nor the gist of the fest. The fest is for everyone – not renegade’s overdrinking & ripping around and ruining it for others. 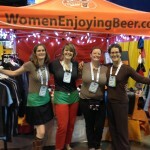 We invite you to come visit our Women Enjoying Beer booth – space P7 this year. 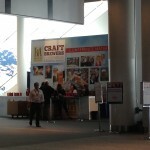 It’s a bright orange, lit up booth where we’ll be glad to help you find high quality goods to wear and share. Women’s & men’s goods, caps & hats, signs and goodies. With so many choices for your wallet, GABF proves to be a zinger. It’s a at-least-once-in-a-lifetime event to take advantage of. Friends familiar and to meet, colleagues, pros, homebrewers, vendors, and volunteers. World class events take a mammoth effort and it’s one we look forward to annually. WEB will also be hosting our weekly BeerRadio program from Black Shirt Brewing Wednesday 10/1 6 – 7 MST. The taproom opens at 5 so feel free to come by for a fresh beer and watch the show in progress. What’s your energy source? Where do you get the gumption to get up and move, shake and otherwise make the world a better place? My money’s on women and beer. Two universal aspects of Life On Earth, these two everyday and everywhere ‘things’ are what drives me forward. Women and beer were more than prevalent in some recent travels too. 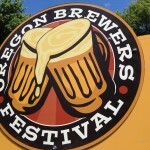 First at the 2014 Oregon Brewers Festival, Portland OR. This festival is a massive one, with tens of thousands of guests roaming the breezy Tom McCall Waterfront Park in the heart of The City Of Roses. Not only do masses of guests descend, the workaday folks in downtown as well as locals show up to support, sip and enjoy. Women make a healthy amount of the guests attending. And why wouldn’t they: Flavor is for everyone. Beer is not a gender drink, it’s global and meant to be enjoyed by all. Last year we lead a Cooking with Beer session in the Grillin‘ Tent; this year I was invited to lead 9 various tasting tours, Trails, we called them, for guests – walking tasting tours covering unique flavors, ciders, and gluten-free choices. Education makes the work go round and it was certainly moving at TFOB! Finally (at the moment!) onward to Mandalay Bay Resort and Casino, in sparkling Las Vegas, Nevada. It’s obvious females make between 75 – 85% of all purchases, as there are always lots of women in Las Vegas taking advantage of all the opportunities to be had there. Sarah Johnson, an incredible quiet and constantly moving forward force at Mandalay Bay, gets it. Check this out. Women and beer. You can bet your top, middle and bottom dollar it matters to include women in the conversations. She’s a flavor lover, an adventurer, and ready to jump in. There are great people everywhere. I truly believe that. And when I get to work with and around them, it makes it all for motivating. Last weekend found me participating in a women + beer event in the lovely state of North Dakota, at the McQuade Distributing Company HQ with 3rd generation company president and very inspiring person, Shannon McQuade-Ely. Shannon and I have worked together before and it was with particular relish and enthusiasm I was asked to help put together (possibly a first for ND) a women and beer + food fundraiser. What a success it was!! 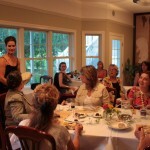 Roomy room, 63 women present to support a cause, try new things, and meet new people. 4 beers, 1 cider, food tastes to match them all. Sunday afternoon, 4 – 6 pm. Suffice it to say, they were lined up outside well before we started (RSVP’s were required), the seats were full of engaged women of all ages and knowledge levels, and they eagerly embraced the event. Knowing in my gut it was going to be a home run, I was thrilled when it actually happened. You can tell the success level of an event, to a certain extent, with the noise level – particularly if you have to regularly ask people to quiet down. It’s a good sign because that means everyone’s chatting and have a great time. Great time = success. 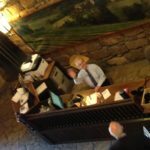 I had to shush often (and always allow open times for guests to chat unhindered…it’s good to get people talking). A special thanks to Shannon and the whole McQuade’s team and all the people who bought tickets. We’ll surely do it again with increased success. The fuse has been ignited, there’s no keeping smart and flavor seeking women back! One of the primary keys to any business success is a true focus and commitment to quality. Another that goes hand in hand is consistency. Great brands are built so the consumer can count on them. In the beer world quality and consistency are talked about quite a bit. I think the conversation was jumped started a bit more when Paul Gatza, the Brewers Association, dropped the f bomb emphasizing quality import at the 2014 CBC. I agree. If you choose not to fully dedicate to quality, get the F out. Of any business. The world has enough crap, enough sub par junk, more than enough mediocrity and middling service, enough detritus for us to float on for millenia. And yet some people, breweries included, still keep pumping out junk. And no, this is not where anyone can trash ABI or SABMiller. Quality and consistency has helped them build their global branded businesses, keeping the experience for the consumer, the same every single time. Sensory Analyst Lindsay Guerdrum, New Belgium Brewing, gave an enlightening and very thorough sensory talk at the 2014 CBC (lots to take in this year…as usual). I want to share a bit of what I took from her talk to this end. Aim for True To Brand; in lab speak – is it “Go” or “No Go”? 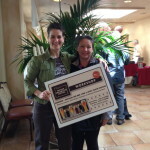 Thanks to Lindsay and New Belgium for continuing to set the pace for quality and consistency. People don’t call the brand Fat Tire (vs. New Belgium ) for nothing. They know what they’re doing. 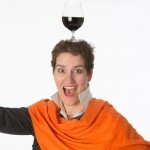 Hats off and glasses up to Kellie Shevlin and the crew who made the first Craft Beverage Expo a success. It was an honor and pleasure to be there last week in San Jose, California. The entire premise is ground breaking AND so sensible, it makes one scratch your head and say “why didn’t anyone do this before?” Well, Kellie did just that. She researched and broke new ground that needed to be tilled. The basis of the Expo is to bring together beer, wine, spirits, cider and mead people to talk about common ground: Bringing Artisan Beer, Wine & Spirits to Market. Regulatory concerns, marketing, sales, and marketing solutions is what was billed. And guess what? You got that and then some. The brilliance of the concept grew on me and I fully appreciate what we can all do when we help and assist. Not that the conventions I’ve been to have been unhelpful. They’ve simply been solely focused on one very specific niche. The point being is that when we intentionally cross categories, then we cross pollinate we share ideas. This is one of thee most powerful tools in creating sustainable remarkable change. To to over 1000 attendees, dozens of trade show exhibitors, speakers, and sponsors the event was one that I took to saying you couldn’t tell it was a first year effort. As a colleague of mine put it, it was well produced. In this he meant that it was all very professional both in appearance and operation. Are there ways the 2015 CBE can improve? Of course – every convention, expo and conference better be looking at continually improvement. Kellie knows this as does her crew and they encourage and welcome constructive feedback. A wise organizer will want specific input to consider moving forward. Well, Kellie – your vision has paid off nicely. Bringing various alcohol beverage people together to talk, listen, share, connect and start and build relationships makes us all stronger. The people I met were well worth the trip alone, the friends and colleagues I saw were also worth the endeavor. 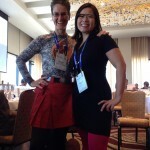 It was a big bonus to be invited to present as well (3 Universal Truths: Attracting and Keeping Female Patrons). 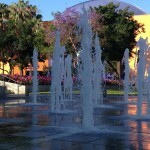 I am eager to get back and explore more of the area too, another benefit to traveling to work events. Your time and dollars are valuable. You want to be sure as possible that your efforts are well founded, rewarding, offer some sort of payback and it’s all enjoyable. We all want to get helpful and useful information, to meet worthwhile contacts and fun ‘new’ people. Perhaps even to get some press and media coverage. The City of San Jose was one place 1. that I had not yet been to 2. that I certainly want to explore more of and 3. has much to offer visitors. The Ethiopian restaurant as well as the Mexican establishment as well as the lovely public spaces….the art museum and technology museum are on my short list. You get the idea. In my work I travel a good deal. One thing I want from my adventures is to feel like attending was indeed a smart investment of time. Like a friend of mine once said, if you don’t like something, “there’s 3 days of my life that I’ll never get back.” The size of the CBE was very manageable too – meaning you could in fact meet those you wanted, have time to talk and not feel too crowded. 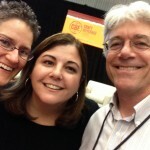 Rest assured when you attend the CBE 2015 you’ll be glad you did. It’s in Santa Clara next year, a relative hop skip & jump from this years host city San Jose. I’m already looking forward to returning. See you there. It’s an honor to be invited to speak at the SOU Leadership Series, on campus in Ashland, OR. Tuesday 22 April, Ginger will be speaking at Southern Oregon University as part of their ongoing Leadership Series. Potential guests are vetted by the various department staff and then invited to present on campus. From 1230 to 120 pm, at the Hannon Library, Meese Room, I’ll be talking and answering questions. The gist is to bring in community business people who are unique and have a singular angle to how they got into doing what they do. If you are interested in attending, simple show up and tell them I invited you (I’m allowed!). I welcome all guests, friends, colleagues and curious folks. After all, Women Enjoying Beer is a pioneering business and I’m very glad to chat and answer questions as it’s helpful to guests. Wow! What a week. The 2014 Craft Brewers Conference was an event to behold and participate in hosted by the fine City of Denver, Colorado. “Craft Brewers Conference (CBC) wrapped up Friday, and it will be remembered as the largest gathering to date. How big? 9,000 industry professionals participated in the conference—that’s a 40 percent increase over the 2013 event. About 1,100 American breweries were represented in this pool of attendees. BrewExpo America also continued its growth and remains the largest trade show of its kind, with 490 exhibitors in 2014. In addition to the main events, the Craft Beer Wholesalers symposium saw 370 attendees, and the Craft Beer Bar Owners Conference brought together 100 participants. 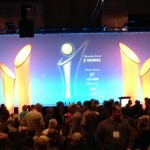 World Beer Cup awards were presented in one of the largest commercial beer competitions on record. If you’ve yet to attend one of the CBC’s and are in the industry in some way, I highly recommend you plan on participating. 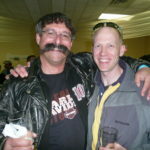 Regardless of where you are in the greater pro beer community, there are connections and friendships to be made, educational seminars to take advantage of, and an overall camaraderie that is like no other on the planet. See you next year in Portland!